“We have started the year very strongly, achieving a record in orders and sales, and have also improved our operating profitability,” said Dr. Roland Fischer, CEO Oerlikon Group. The positive sentiments in the global economy continued from 2017 into the first quarter. The high level of capital investments and demand for services were seen across all Oerlikon’s end markets. Effectively exploiting the market opportunities, Oerlikon achieved an all-time high in order intake and sales – raising both by more than 35 % year-on-year – and a nearly 60 % increase in order backlog. At constant exchange rates, sales stood at CHF 787 million. The Surface Solutions Segment remained on its growth course, increasing orders and sales in equipment, materials and services globally. In particular, very strong demand was noted in general industries. The Manmade Fibers Segment significantly boosted its top line and operating profitability. The Segment more than doubled orders and sales, attributed primarily to the filament equipment business in China, and substantiated with a high level of new business in India and Turkey for filament equipment, as well as for texturing, carpet yarn and staple fibers equipment. The Drive System Segment realized around 20 % gains in orders and sales, as it secured wins in all key end markets globally, in particular in agriculture, transportation and automotive. Bolstered by the exceptional top-line performance and reinforced by disciplined cost management, the Group’s year-on-year EBITDA increased to CHF 123 million, yielding a high EBITDA margin of 15.1 %. EBIT for Q1 2018 stood at CHF 72 million, or 8.9 % of sales. 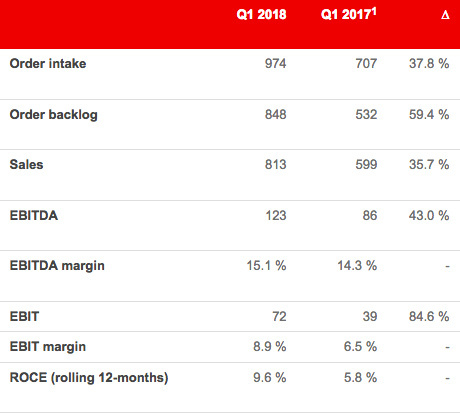 The first-quarter performance resulted in a rolling 12-month Oerlikon Group ROCE of 9.6 %, reflecting the higher operating profit over a slightly increased asset base. For the first quarter of 2018, Oerlikon generated 30.4 % of total Group sales (Q1 2017: 37.8 %) through services, reflecting the high level of equipment sales, specifically in the manmade fibers business. Oerlikon expects the overall positive momentum in its end markets to persist in the upcoming quarters. However, geopolitical tensions and protectionist policies could impact international trade and business in industrial sectors. 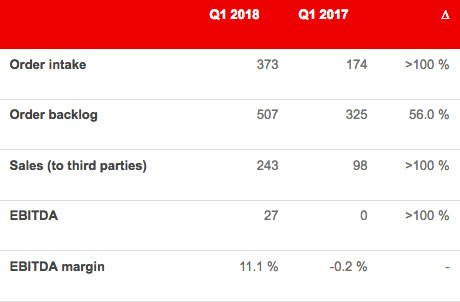 Based on the Group’s strong performance in the first quarter, the Group expects order intake to increase up to CHF 3.4 billion and sales to around CHF 3.2 billion for the full year 2018, and to deliver an improved EBITDA margin, after offsetting investments in additive manufacturing, of around 15 %. The filament equipment business was the main contributor to the Segment’s remarkable performance in the first quarter. The Segment secured large-scale orders and benefited from positive market sentiments for upgrading of production capacities. The strong sales for filament spinning machines provided a stable project landscape for texturing machines. The Segment’s top-line growth was mainly led by business wins in China, however, a high level of demand was also noted in India and Turkey for filament equipment, as well as for texturing, staple fibers and carpet yarn systems. In North America, a noticeable uptick in orders was registered, attributed to the healthy growth in the carpet yarn business in this market. Supported by the high level of sales, EBITDA was more than 100 % higher than in the previous year. EBIT for Q1 2018 stood at CHF 22 million (Q1 2017: CHF -5 million) and the EBIT margin was 8.9 % (Q1 2017: -5.4 %).